One thing that’s always been of great interest to me is the story about the demon that appears in the background when she throws her ofuda and stuns enemies. I’ll admit that, having first seen Sailor Moon with the (censored) DiC dub, the first time I saw the demon – which they forgot to censor in one episode of the first half of Sailor Moon R (in the Doom Tree saga)1 – it was pretty terrifying. It didn’t help that it was 2am and in a dark room, of course. So what’s the story behind the demon? Who is he, and what is his connection to Rei and her banishing of evil spirits? As we’ve already discussed in the past, Rei’s use of religion is a bit of a mixed bag in the Sailor Moon series (and the anime in particular), so it shouldn’t come as much of a surprise to find out that this demon isn’t actually a Shinto god at all, but actually can be traced back to Buddhism. Now, that’s not to say that Buddhism and Shinto are two completely separate entities. They were originally, of course, but over the years (and in a desire to try to explain away inconsistencies in beliefs), many of the Buddhist bodhisattvas2 (in a nutshell, someone who has come to understand the trues teachings of Buddha; akin to a saint in Christianity) came to be worshipped as Shinto gods, and many popular Shinto gods were considered to be bodhisattvas. In the case of Rei’s banishing of spirits, however, there’s a strong and clear Buddhist connection. 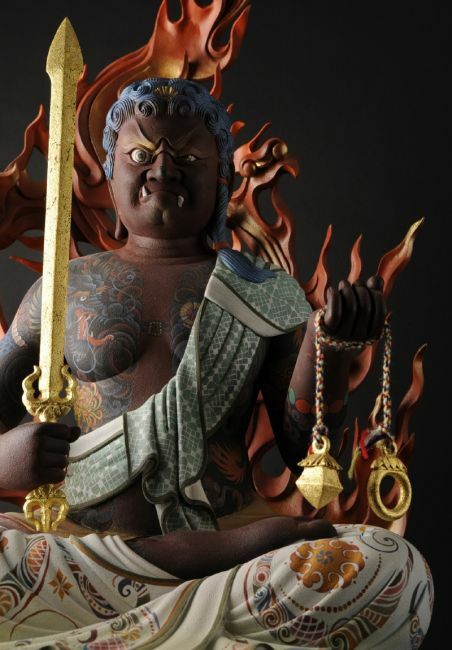 The demon that we see here is not a demon at all, but rather the Buddhist god known as Acala,3 one of the five Wisdom Kings,4 who is traditionally depicted with a sword in his right hand, a lariat or a noose in his left, and fire in the background. Acala, known as Fudou Myou’ou (不動明王; Unmoving Wisdom King), gained quite a following in Japan5 and had a great deal of art, statues, and no less than 34 temples dedicated to him.6 Considering that strong tradition, his warrior-like nature, and the association with fire, it’s not too surprising that he was a good fit for Rei’s warding off of evil energies. It seems like the more you look, the more there is to find in the Sailor Moon universe, and I’m always impressed at just how far not only Ms. Takeuchi went, but the TV Asahi and Toei staff in creating the companion anime series. It’s always exciting to see what other mysteries there are to uncover! ← What Is the Shared Mythology Between Luna, Artemis, and Diana? Interesting so then do think Acala might be the deity/kami the Hikawa Shrine in the Sailor Moon universe would likely have been dedicated to? I know the real life Hikawa Shrine is apparently dedicated to Susanoo the god of seas and storms…but that doesn’t really mesh with Rei at all does it? Can I also ask a related question about Shinto….as a Shinto shrine maiden would Rei have actually believed the mythology like the creation story of Izanami and Izanagi at their word as having happened? The reason I am asking is it occurred to me that stuff like the Galaxy Cauldron and Star Seeds runs fairly contradictory to the ideas of the many religions as far as the source of the creation of stars/planets/galaxies, So it just kind of made me wonder if Rei whose goal was to run a shrine finding out about this kind of stuff as fact would have likely caused major conflict with what she previously believed? Considering that Acala is from the Buddhist faith and that Rei is a priestess of a Shinto shrine, in a perfect world I’d say that he most definitely isn’t the deity/kami of the Hikawa shrine. 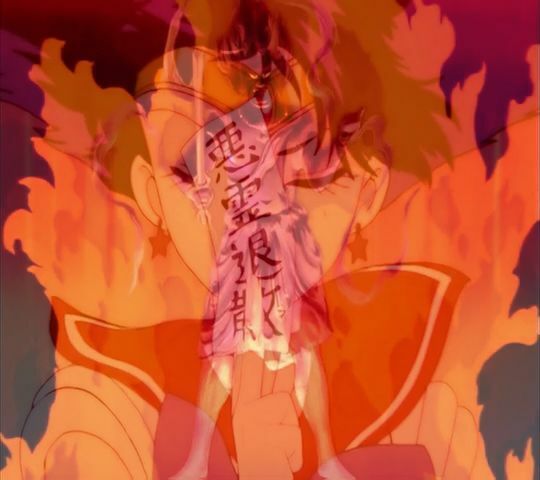 Alas, when you look at what a mixed bag the interpretation of Shinto ends up being in the Sailor Moon anime, like with the bizarre fire-reading and other things unrelated to Shinto, I think it could be a decent argument. Also, it’s not unheard of for Bodhisatvas and Shinto kami to be “borrowed” and adapted to fit the other religion. If I recall correctly, for a short time even some Christian saints were being called Bodhisatvas as a way to try to legitimize Christianity with the state-sanctioned Buddhism. But that’s neither here nor there. As for how Rei can make peace with herself over her Shinto faith and how the world of Sailor Moon clearly conflicts with it, to be honest, I’m not entirely sure that she actually is strong in the Shinto faith to begin with. As I mentioned before, the vast majority of priestesses used over the holidays are just part-timers and don’t necessarily need to be believers. My feeling about it has always been that Rei is spiritual, but her connection to Shinto is limited to her fulfilling her duties as the granddaughter of the head priest. At least that’s how I justify it!